How to find the money that is out there? Sooke Region Volunteer Centre (SRVC), Doni Eve of Saseenos Communications and Mary Brooke Sooke Voice News are pleased to support local small businesses and non-profit groups with our new training opportunities. These workshops are open to Sooke and area volunteers, small business owners and non-profit organizations, and are kept 'affordable' through sponsorship from funding obtained by SRVC. Marketing, Promotion & Communications will provide you with some new tips and tricks. The workshops will be held over two Saturday mornings, May 9 and 16 (9:30- noon each Saturday) and will help build awareness of events, attract new members and raise revenue through donations or grants. Participants can discuss their communications challenges, learn how marketing, promotion and communications can benefit their organization in today’s rapidly changing communications environment and receive hands-on help in developing a strategy. They will also receive feedback and discuss getting the message out, social media and no-cost and low-cost techniques. Participants will take away additional resources including handouts, templates and further reading list and be able to sign up for one-on-one structured feedback at a later date to polish their final product. This workshop is free for SRVC members and $10.00 for non-members. To register for either or both of these learning opportunities or to receive more information, contact sookeregionvolunteers@gmail.com or leave a message at 250-642-6364 Ext. 235. We plan to continue to bring affordable training and workshops into the region. Please let us know what you want to know by completing our short survey. This was a collaborative event organized by Sooke Region Food CHI and Sooke Region Volunteer Centre. The workshop was considered a success by participants, organizers and presenters! The Grantsmithing workshop brought 45 non-profit and small business focused individuals to hear presentations by Andrea DiLucca and Valorie Logan of VanCity Credit Union and Carol Hall of Victoria Foundation. The evening started with a lovely soup and salad dinner catered by the EMCS Chef's Training Class and an opportunity for participants to network. The workshop had general focus on how to find grants, especially ones where the funder and applicant are well matched with respect to goals. It is also important to develop a relationship with funders, get to know each other, and what other connections and support might be available. Funders sometimes have resources other than funds to help organizations, such as trailing, mentorship and even volunteers! The process is about understanding each other's needs, not just our own. Steps to becoming a sustainable organization were also reviewed. After the overview, our presenters quickly discussed the general requirements of their respective organizations. Questions were many and interest was high, so high that we went slightly over-time and had to ask participants if they wanted to continue with questions or move on to the Case Study portion. Consensus was that we proceed to the round tables to discuss a Case Study using the Sooke Community Hall as an example of how organizations might work together to achieve a common goal, obtaining more than any one could achieve alone. Conversations were varied and lively. "I visited the Vancity website but I was overwhelmed. Now I understand how easy it is"
"Networking with non-profits – the case study was great! To have the opportunity to have breakout groups following was fantastic!! So many ideas sparked!" "Maybe inter-organization round-tables ro discussion sessions. It became very clear that many groups had info/resources the others needed, yet they didn’t know it." "That was a most entertaining, informative and valuable evening. I learnt a fair bit about a field that's new to me, met some interesting folks for the first time, renewed my sense of solidarity with the larger community of non-profits ... and enjoyed a good meal in the bargain. Much appreciation to Anita, Marlene, Phoebe and anyone else responsible for putting this event together." "How often do you have these events. I think every three months would be ideal." Yes, we will continue to bring training and workshops into the region. Please let us know what you want to know by completing our short survey. The 5th Annual Sooke Region Volunteer and Non-Profit Fair will be held Saturday, April 9th, 2016. Please put it on your calendar now so we can make this the biggest and best event ever. Twenty-three area non-profit organizations attended this year's event on a very spring day with sun, rain and wind switching it up moment to moment. Two additional organizations set up unmanned displays. While attendance by the public was low, about half the number of people attending the last three, every attending organization received at least one sign-up! It appears that those who came, came with intent! The fair provides an opportunity for some of the movers and shakers in our community to network, catch-up and share ideas. The need for networking opportunities has been highlighted over and over again throughout the years, and this annual event provides a great opportunity, and many people expressed their awareness of that value in attending the fair. Sooke Region Volunteer Centre volunteers operated a Bistro throughout the event, providing attendees with nourishing options for food and refreshments, and filling the space with lovely aromas! We also held a small silent auction to help raise funds to cover this free-to-members event. We raised $363.00 towards the over cost of $745.99 to put on the event. In addition SRVC sponsored the space and printing to a value of $285.00. "There was a great opportunity to speak with others and also there were folks actually looking to volunteer who came to the event and they were selective." Sooke Region Volunteer Centre will be providing the refreshments at the Sooke Community Choir event on Sunday, May 10th, Mother's Day. Sooke Family Resource Society will be managing the refreshments for their events on Friday the 8th and Saturday the 9th. Come enjoy and support the Choir and support us to continue supporting volunteers and volunteer based organizations. Details of the Choir events can be found here. National Volunteer Week marketing tools - NVW 2016 April 10-16, 2016 with the 5th Annual Sooke Region Volunteer & Non-Profit Fair being held Saturday, April 9th, 2016. Please put this on your calendar so we can really showcase what makes us a 'Volunteer Capital in Canada'. As a member of Volunteer Canada we have access to a comprehensive database called Ajah Fundtracker at a 10% discount. 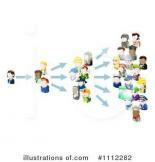 The database membership costs $1,000.00 per year and is prohibitive to all but the largest organizations. 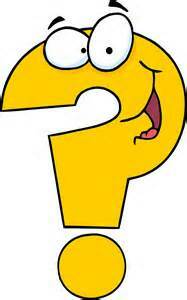 We are wondering if there is enough interest in having an extensive Canadian database available here in Sooke? If 9 organizations came up with $100 (including SRVC as one) or 18 organizations putting in $50 each, this would make it affordable. Other organizations wanting to use the database would have to pay a fee. Ajah Fundtracker is an innovative online service that helps non-profits identify and connect to funders interested in their cause. A comprehensive online database of funding opportunities for the voluntary sector, it offers essential up-to-date information on over 11,000 funders, from foundations to government-funded programs to corporate support. Gain access to details on funders’ deadlines, granting history and contact information. 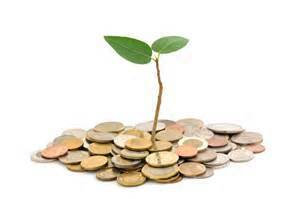 Fundtracker can help you raise more money, diversify your funding and save time and resources doing it. We are a Montreal-based software company that builds tools that the Canadian non-profit sector needs. We combine open and public data with our own research to help funders and non-profits better understand the patterns, and specifically the risks and opportunities in their funding environment. The founders of Ajah have backgrounds in community development, software development and web entrepreneurship. We have an established record of developing easy-to-use, innovative software for the community sector. With advisors from Canada, the USA and the UK, our non-profit initiative, PoweredbyData, helps stakeholders collect and publish transactional, contextual and impact data about the non-profit sector that is open and interoperable. See more on the Volunteer Canada website. Island Health is looking for an energetic, enthusiastic and experienced Manager, Volunteer Resources to manage a large group of volunteers (300-500) in various programs at the Nanaimo Regional General Hospital. For more information and to apply visit their website. The position is open until filled. Employment Opportunities link on our website. The Burnside Gorge Community Association is seeking one part-time Out of School Care Leader as well as multiple on-call positions. Position is approx 10 hours/week, $14/hour. This posting will remain open until the positions are filled. Full job description and application details are available on our Employment Opportunities page. Oaklands Community Association has openings for Activity Leaders in their Out-of-School Care Program. Positions are approx. 27 hours/week, $14.25/hour. We are also looking for Substitute On-Call Activity Leaders and this position can lead to a permanent shift. These postings will remain open until positions are filled. Full job description and application details can be found on our Employment Opportunities link on our website. Farewell to a Dedicated Volunteer. Good Bye to Vern Moore! Vern will be missed by many and his absence will leave a big hole in many organizations' volunteer base. Vern, and Martha, have been dedicated to this community since the first day they arrived. It will take a number of pairs of shoes to fill yours, Vern! 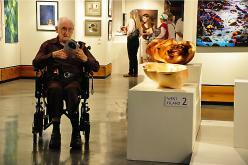 We borrowed this picture from the Sooke Fine Arts Society newsletter. Elida Peers, founder and coordinator of the Show's "museum days", has written a lovely tribute to Vern in the Sooke News Mirror. All events and volunteer positions are full! All businesses are prospering! Isn’t that a lovely dream! What can we do to work towards this dream? In part, by working from a sense of plenty. Sooke Region Volunteer Centre (SRVC) and Saseenos Communications are pleased to support local small businesses and non-profit groups with our new training opportunities. Workshops in May are open to Sooke and area volunteers, small business owners and non-profit organizations. Marketing, Promotion & Communications will provide you with some new tips and tricks. Originally scheduled for April, the workshops will be held over two Saturday mornings, May 9 and 16 (9:30- noon each Saturday) and will help build awareness of events, attract new members and raise revenue through donations or grants. The Grantsmithing Workshop was held Thursday, April 23rd at Edward Milne Community School. It started with a soup, salad, bread & cookies dinner - providing a great opportunity for the 45 participants to network. The food was provided by the Chef's Training Class at EMCS and was delicious, which was no surprise! The presentations by VanCity Credit Union, Andrea Di Lucca & Valorie Logan, and Victoria Foundation, Carol Hall, was so helpful and informative that people were still asking questions when it was time to go on to the next phase. The Case Study portion had people move to round tables to discuss how collaboration could take place within, and outside of the community, and what a sustainable. "The workshop was valuable since eventually .... It’s given me an intro into the non-profit world and I’m learning where to start building networks. It was also inspiring to meet so many people wanting to help better the world"
East Sooke resident has an opportunity of a lifetime, and he’s seeking the funds that will enable him to take advantage of it. Jeremy Smith has been accepted into an M. Sc. Program with the University of Copenhagen, into their SUTROFOR (Sustainable Tropical Forestry) program. Do you want to join us for another free Wild Apricot webinar? Everyone talks about sponsorship, but how many organizations profit from win-win partnerships for their events and program? The answer is too few! Joe Waters (Selfish Giving) knows what both partners want and need. And he's going to share his insight at our upcoming Wild Apricot free expert webinar. We can set up a computer and projector here at the Volunteer Centre office to watch the webinar and have a group discussion afterwards. Please let us know if you wish to register on your own or join a group registration and discussion. Did you know that about half of home address numbers are not visible from the street after dark and many are also not even visible in daylight? This is a real concern for emergency first responders who cannot help you if they cannot find you! As Sooke residents, you may be aware of recent emergency situation in Sooke that was hampered by poor signage. You can read the Times-Colonist article here. Mentoring workshops: Grow Your Own Backyard Food? Our apologies to Glen Thelin of Glen's Gardening Company for incorrectly showing his name in our last 'Welcome to our Newest Members'! This presentation is shaping up to be a big event. We have over 35 people registered! What a networking opportunity in its own right! Presented in partnership between SRVC and Sooke Region Food CHI. It will be an informative evening for local groups to learn ways to source out successful partnerships and funding grants. Representatives from the Victoria Foundation and Vancity Foundation will be on hand to provide tips on how to get grant funding. A case study will be used to show by example. Date: April 23, 6 pm (light supper with event to follow). Cost: $10.00 for FoodCHI and SRVC members and $20.00 for non-members (including supper). RSVP to info@sookefoodchi.ca. We want to know what you want to know. Please complete a short survey on the Sooke Region FoodCHI website. Date: Saturday, May 9th and continues on Saturday, May 16th (9:30-noon each day). Effective promotion and communications help local groups build awareness of events, attract new members and raise revenue through donations or grants. On the first day, participants can discuss their communications challenges, learn how marketing, promotion and communications can benefit their organization in today's rapidly changing communications environment and receive hands-on help in developing a strategy. The next weekend they will receive feedback and discuss getting the message out, social media and no-cost and low-cost techniques. Participants will take away additional resources including handouts, templates and further reading list and be able to sign up for one-on-one structured feedback at a later date to polish their final product. The photo contest entries are in! This year, more than 190 photos were submitted with photos that recognize, celebrate and thank volunteers. Look at all those happy faces around the province. Stay tuned - winners will be announced in the next Connector. Girl Guide cookies are for sale in various locations in Sooke. We bought ours from Bethany, who was selling her wares outside of the Shoppers Drug Mart, late Sunday morning (April 12). She got the sunny shift. The cookies are the chocolate and vanilla sort, and cost a mere $5 (cash) per package. Support the Sooke chapter of Girl Guides and get your cookies today! Sooke's First Scrabble Tournament: Congratulations to Wilf Wenzel, Sooke's Grand Scrabbler for 2015! And thank YOU for participating, spectating, and donating. Edward Milne Community School Society raised over $1,100 for our local literacy programs and our "munch card" initiative for EMCS students who'd otherwise go hungry during the school day. Thank you for your support! Thinking about the small kitchen garden, patio food garden in tubs, or the family veggie patch? YOU CAN DO IT – with some basic hands-on gardening mentorship. Sooke Food CHI is offering hands-on mentoring sessions for the novice and experienced gardener. Community-based social marketing (CBSM) encourages individuals to make life changes that are good for them and their community. Rather than trying to get people to buy cereal or a car, social marketers encourage them to do things like share more, reduce food waste, or stop smoking. Recently, the West Coast Climate and Materials Management Forum hosted a webinar on social marketing featuring Amanda Godwin from Colehour + Cohen who explained how to implement CBSM techniques to achieve lasting behavior change within communities. Her advice is highly relevant to citizens and city officials who want to encourage more sharing where they live. Below are Godwin’s 10 steps for building a successful social marketing campaign. Brought to you by Edward Milne Community School Society. Check out the tips and ideas for testing the effectiveness of your social media marketing. They include a downloadable PDF document for your convenience. When businesses thrive, our communities thrive, there are more jobs and more support for the many non-profit based initiatives. Social media is the new 'word-of-mouth'. At Sooke’s recent Chamber Awards, local longtime business owner Frederique Philip (co-owner, Sooke Harbour House, winner of Sustainability Leadership) issued a challenge to the community of Sooke: Go online and rate businesses in Sooke. Any 10 businesses. This small act could have a big impact in supporting the local business community. By click-voting and adding a simple review of your honest opinion, local businesses and residents of Sooke can collectively boost our economy. And when that thrives and grows, the opportunities for local jobs also thrive and grow. Victoria Cool Aid Society is looking for a Facilitator of the innovative and empowering Every Step Counts program.This is a permanent part-time position that includes great employee benefits. Details are included in the job posting. Please forward written expressed letter of interest and resume in confidence to: Lori Ferguson, lferguson@coolaid.org by Monday, April 20, 2015 at 4:30pm. We would like to know what you would like to know! The Sooke 'Small Town, Big Talent' Show! Invitation to be Part of the Solution! Small business owner, Sheila Wallace, of Sheila's Coastal Crunch Granola has kindly and generously offered to sponsor the Sooke Region Volunteer Centre. One dollar from every bag of granola sold between now and the end of May will be donated to the Volunteer Centre to help continue our community efforts. Sheila has also provided us with several bags of granola to sell at Saturday's 4th Annual Volunteer & Non-Profit Fair. We will receive a larger share of the proceeds from these bags, $2.00 from each small bag and $3.00 from the large bags. You may purchase from us at the Fair or find Sheila at the Sooke Country Market running from May to October every Saturday. Or by calling Sheila's Coastal Crunch directly at 250-642-7906 or smwallace@shaw.ca. will take place on April 23rd, presented in partnership between SRVC and Sooke Region Food CHI. It will be an informative evening for local groups to learn ways to source out successful partnerships and funding grants. Representatives from the Victoria Foundation and Vancity Foundation will be on hand to provide tips on how to get grant funding. Everyone welcome. Especially our members. Come have your say. Help us set our next priorities. The University of Victoria’s Resident Services and Volunteer Victoria’s Youth Team are proud to officially announce the third Project Serve date for 2015! Sooke Region Volunteer Centre will again be applying for UVic students to help with a community project. The Grand Cook-off last fall was considered a great success. We can do something similar or maybe you have another idea! We'd love to hear it. Deadline for submissions is April 18th so please send us your ideas ASAP. The Grand Cook Off was planned as an event to bring non-profit groups together to ‘cook, bake and can up a storm’. The resulting products, pies, bread, jams, etc. would be sold and the proceeds shared between the participating organizations. SRVC were successful with their proposal and engaged 14 ‘free’ volunteers through UVic & Volunteer Victoria’s Project Serve Day. In addition, three members of the Sooke Region Community Health Initiative (CHI) committee and two Rotary Club of Sooke members came forward to be part of the general pool of volunteers. Read the full report here. Help send kids to camp by racing rubber ducks in Sooke. The Sooke Harbourside Lions will once again be hosting their annual “Rubber Duck Race” at the Sooke Flats (aka the Sooke River Campground) on Saturday, May 9, 2015. Each year Volunteer Victoria recognizes the valuable contribution of our youth volunteers by sending Youth Recognition Certificates to high schools, middle schools and elementary schools to be presented at their Awards Day Ceremonies in June. If you have youth volunteers with your organization please forward your AGENCY'S NAME, STUDENT'S NAME AND SCHOOL THEY ATTEND to Fan Zhang. Please type or print this information then email fan@volunteervictoria.bc.ca or Fax: 250-386-2279 before May 01, 2015. Please note this is for elementary, middle and high school students only. Thank you for your interest. The upcoming Patients as Partners| Patient Voices Network orientation session to be held in Sooke on Friday April 24, 2015. We are looking to increase the number of patient volunteers from the Sooke area. However, this orientation is open to others who can travel from other communities in the South Island area for the orientation session. This is not a public drop-in event so a registration process is required. We connect with individuals one-on-one beforehand. Once they go through the intake process we make them aware of the orientation event details, if they want to take that next step in the Network. Click here for answers to Frequently Asked Questions, and here for the Sooke Poster. In this third installment of the Charities Program Update, I set out some of the measures we have taken in the Charities Directorate to promote transparency, both in terms of our programs and the diverse activities of the charitable sector. Registered charities in Canada are subject to constant change because of evolving social needs, technology, expectations of funders, demographics, court decisions, and legislated requirements. We in the Charities Directorate recognize the demands that are placed on Canadian registered charities, and we are committed to facilitating voluntary compliance with the laws and rules related to registered charitable status. "Come to the animal fair, tah dah! The birds and the bees will be there, tah dah!" New Benefit to SRVC Membership! How do you show appreciation to your volunteers? 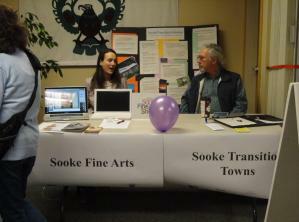 CRD Arts Development Service marking a difference...... but not for Sooke? From Transition Sooke: Kinder Morgan is coming to town! Did we catch your attention? We're not really having an animal fair, but you probably already guessed that! Do you recognize this song from your childhood? We looked it up, it originates for the late 1800's! While volunteerism in Sooke could well have been around almost that long, formalized organizations began in the 1920's. 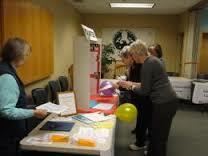 Volunteer & Non-Profit fairs, a bringing together of residents and area non-profit organizations, started to appear in the Sooke area until 2011. Canadians from other areas will be more familiar with them. We have had great positive feedback on the previous events. We have also received feedback about a feeling of dissatisfaction with the experience. Sounds pretty normal to me. We have been listening and taking into account as much as possible. It was interesting to note that we received the most complaints about the event held at the Community Hall. People felt it was too spread out and not enough of the public came. Others felt it was a great venue! Some people felt last year's event at the Family Centre was too small and not enough visitors came. Interestingly, we actually had almost the same number of presenters and visitors at both. The 1st Annual event was the best attended by organizations with 12 presenting to youth at noon and 54 in the evening for the general public. Compare this with around 23 presenters at both the 2nd & 3rd annual events. At all 3 events we had around 100 general public attended. It's funny what perception can do to us! We hope you will attend as a presenter or as a visitor. Come find out more about your community! As more people understand the concept, both as presenters and exporers, this will continue to grow. We look forward to you attending which will help us continue to help you. Something special for Sooke’s non-profits! Sooke Region Food CHI and Sooke Region Volunteer Centre invite you to an informative evening learning approaches and tips to how to source out successful partnerships funding grants. The money is out there, how can we all bring more of it to our communities? Representatives from the Victoria Foundation and Vancity Foundation will join us for the evening. We want your help – tell us what topics or questions you would find helpful. For more information and to participate please complete the on-line survey here or contact us at sookeregionvolunteers@gmail.com for a Word document version. Please complete this survey by March 13. Due to unforeseen circumstances our instructor has requested that we move the Marketing workshops to early May. They will remain on Saturday mornings at the same time, though now set for May 9th and 16th. The Sooke Region Volunteer Centre (SRVC) will be presenting these and other educational opportunities for local non-profit organizations and area volunteers who wish to update or increase their skills. Do you know the difference between 'Marketing', 'Promotion', and 'Communications'? Did you know there was a difference? While the words are often used interchangeably, there really is a difference. Come learn from our experts. Find out the whens, wheres, hows and whys of these topics. Effective promotion and communications help build awareness of your organization or event to attract new members and attendees, it can help you raise revenue through donations or grants. and it can keep you in touch with your members and customers. In addition to the hands-on workshop, you will take away additional resources including handouts, templates and further reading list. You can discuss your challenges and work on your own communications product and will be able to sign up for one-on-one structured feedback at a later date to polish your final product. NOTE: For anyone registered already, if you can not attend on these dates our instructor will connect with you to provide on- on-one consultations. The Sooke Region Non-profit Marketing and Communications Workshops are sponsored by SRVC and Saseenos Communications. Saseenos Communications is dedicated to helping Sooke region volunteer organizations, small and home-based business and artists share their stories - for free! The workshops will be conducted by Doni Eve who has a "lifelong passion for promoting the people, places and spirit of our awesome community". Doni's background includes a Bachelor of Journalism (Hon) degree from Carleton University; Graduate Professional Certificate in Public Sector and Non-profit Marketing from Sprott School of Business; Marketing Your Small Business from West Shore Learning Centre and 25+ years of professional work in journalism, communications, public relations, health promotion and social marketing. For more information see: http://www.saseenos.com/. The folks at the Sooke Region Volunteer Centre will be arranging more training and workshops to presented in Sooke, and maybe even some out to East Sooke, Otter Point, Shirley, Jordan River and Port Renfrew. Let us know what type of training would help you by filling in our short survey. April 12 - 18th, 2015 is National Volunteer Week. How do you demonstrate your appreciation of the time, dedication and sometimes even finances that your volunteers contribute to your organization? We would like to share an overview in the National Volunteer Week issue of this newsletter. Please submit your stories. We know it is hard to single out one dedicated volunteer from the others. It may be that one or two people have done an outstanding job that you would like to recognize. Here is an opportunity to send a brief write-up recognizing that someone extra special who works quietly behind the scenes or has taken on a monumentus task for you. Or maybe it is one of your longstanding volunteers who is now 'retiring' that you wish to recognize? You may submit a picture as well, if you like. Findings from the most comprehensive study on giving and volunteering reveal that Canadians continue to be generous by volunteering close to 2 billion hours in 2013. However, the survey also indicates that 12.7 million Canadians volunteered in 2013 compared to 13.3 million in 2010. What does this mean for the future of volunteering in Canada? The information also tells us that the volunteer landscape has changed. Canadians continued to be generous by volunteering close to 2 billion hours in 2013. However, the survey also indicates that 12.7 million Canadians volunteered in 2013 compared to 13.3 million in 2010. Youth (15 to 19 years) are more engaged with 66% volunteering an average of 110 hours per year. While the volunteer rate decreases with age, older adults (55 and over) continue to contribute the most (39%) of all hours. Notably, Canadians between the ages of 35 to 44 saw a 6% drop in their volunteer rate. The CRD Arts Development Service provides funding support to arts organizations on behalf of 8 municipalities in the capital region: Victoria, Saanich, Oak Bay, Esquimalt, View Royal, Metchosin, Highlands and Sidney. The Arts Service has three funding programs Operating, Project and IDEA grants. We are wondering why only these 8 municipalities are included since we all pay into the CRD? The deadline for the CRD (Capital Regional District) Arts Development IDEA and Project Grant applications is Friday, May 1, 4:30pm. With climate change rampant, we believe now is the time to transition away from dirty fossil fuels and to invest in clean energy, instead of expanding the greenhouse gas producing tar sands. Because Supernatural BC, the Best Place on Earth, deserves to be treated with respect. The network is a community of patients, caregivers, and family members who are using their experiences to improve health care in BC. Mary Chudley, Engagement Liaison, would like to have the opportunity to present, share, connect with and promote the Patients as Partners|Patient Voices Network in the Sooke area. She needs your ideas and help on this. If you would like to host a presentation see below for further details. Everyone accesses the health care system at some point in their lives. Many of us have also supported family members and friends in their journeys through the health system. Anyone is welcome to join the network, because we are all patients. Patients as Partners | Patient Voices Network is a Ministry of Health, Patients as Partners initiative administered by ImpactBC. The Network is a community of BC patients, families, caregivers and others who are using their experiences to influence change in BC’s health care system. Through the network, patient volunteers have the opportunity to work openly and collaboratively with health care providers and decision-makers by lending their voice to important discussions around health care service delivery. Activated patients are eligible to participate with health care partners in collaborative opportunities such as advisory committees, working groups, focus groups, conferences, or other projects. There will be an orientation session held for new volunteers who want to become involved in the Network on Friday April 24 in Sooke. This is a 4 hour session. Location information and details will be forwarded to individuals after they have an initial conversation with Mary Chudley. If individuals register on our website to “Become a Volunteer”, they will receive a phone call/email to set up a time to talk about questions and to get more information. We purposely do not advertise the location of the orientation until individuals have an intake interview. Prior to the orientation session, Mary Chudley welcomes any invitations to speak with community groups or service providers groups about the Network so that people can know and understand the process. She invites any opportunity to come in person to speak with service providers, staff meetings, community groups, or to fit into an already existing agenda of a weekly/monthly meeting, to speak about the Network. Swan Lake Christmas Hill Nature Sanctuary is seeking bookkeeping/financial administration services for $23 per hour, about 40 hours per month. Qualified individuals with expertise in QuickBooks and non-profit accounting are invited to contact info@swanlake.bc.ca for a full list of duties. Position open until filled. Victoria Cool Aid Society is looking for a Facilitator of the innovative and empowering Every Step Counts program. This is an opportunity for a dynamic and committed individual to use their skills, knowledge and experience to lead a positive and healthy community-based program. This is a permanent part-time position that includes great employee benefits. Details are included in the job description. 4th Annual Volunteer & Non-Profit Fair, Sat. April 11th, 2015 12:00 - 3:00 p.m. This Saturday at 8.30pm local time it’s Earth Hour. Regular ongoing hours: Tues to Sunday 9 a.m. to 5 p.m.
March 28 to May 30 with rotating exhibits. The show highlights fourteen established and new artists. Some will be showing their work for the first time at this event. The show includes fibre art, driftwood, photography and painting, along with artifacts and images of historical importance. See who the new artists are in town! Unique to this show is Bobbie Momsen and her images painted on bird feathers, Linda Anderson and her "vertical line" paintings, and Linda Gordon with "Fotograffia" or painting on photos. 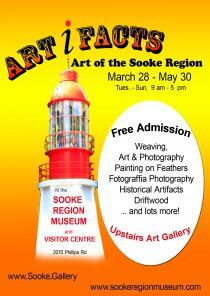 As well, there will be well known artists and photographers adding their interpretation of the Sooke Region. Shaw TV interviewed Linda Anderson and Linda Gordon the other day. The feature will be going on the air on Wed., April 1st in their Go Island show on Shaw TV, Channel 4. The program is shown throughout Greater Victoria, the Cowichan Valley, Salt Spring, Galliano and Pender Islands. The TV interview starts on April 1st, and will start at 6 pm, with repeats later in the evening and overnight as well. It will be shown Thur., April 2nd and Friday April 3rd, starting at 6:00 p.m. and playing several more times throughout the evening as well. 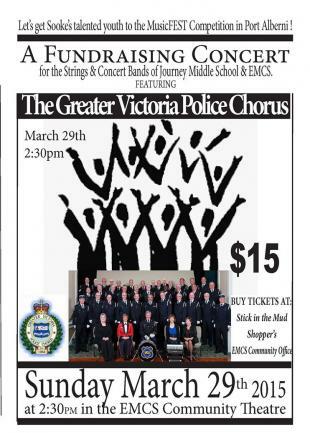 Who: Greater Victoria Police Chorus with performances by the students of Journey Middle School and EMCS band program. Date: Sunday March 29th, 2015. Why: This is a fundraising concert. We are hoping to raise enough money to get the students to the MUSICfest Competition in Port ALBERNI on April 9th, 2015. Doing well at the Port Alberni Competition would open the door to performing at the National level. Tickets are on sale at The Stick, EMCS Program Office and Shoppers. Come find out what some of the over 180 non-profit clubs, groups, societies and charities are doing in the area we call the Sooke Region, from East Sooke to Port Renfrew. There will be refreshments, games and a silent auction. This event is also a great opportunity for networking between organizations. "You're doing what?" '"Well, we've go this that might help! Let's talk!" When the buzz starts people get re-energized and feeling enthusiastic again. It's contagious and this is an opportunity to catch it (again)! Come see who's doing what. Rub elbows with the movers and shakers, and a few of the quietly doing, people in your community. Whether you are looking to volunteer, wanting to know what programs and services are available, or just plain curious, this is the event for you. We are accepting registrations for area clubs, non-profit organizations and businesses who engage volunteers. Organizations that are located outside the region but offer programs or services here are also welcome. 4' display table space free for members/$20 for non-members. ($25/yr and we have a lot to offer). Additional table space can be rented at an additional $10 for 8' of table space. A Grantsmithing Tips Evening presented in partnership between SRVC and Sooke Region Food CHI. It will be an informative evening for local groups to learn ways to source out successful partnerships and funding grants. Representatives from the Victoria Foundation and Vancity Foundation will be on hand to provide tips on how to get grant funding. Date: Saturday, April 18th and continues on Saturday, April 25th (9:30-noon each day). Effective promotion and communications help local groups build awareness of events, attract new members and raise revenue through donations or grants. Zero Waste Sooke, a local citizen's initiative arising from Awareness Film Night and Transition Town Sooke, is meeting monthly at the SRVC. A founding group of volunteers led by Inishoge Farm's Steve Unger gathers again on Monday, March 30 at 7 p.m. Anyone in town interested in exploring the many ways we can individually and collectively reduce our household, business and municipal waste streams is welcome to attend. Subjects discussed at the first meeting in February included the need for more public education, regional yard-waste and compost facilities, roadside litter clean-up campaigns and, as a top short-term priority, a community forum on local waste management issues. To learn more, please visit the ZWS Facebook page: https://www.facebook.com/pages/Zero-Waste-Sooke/992980690715446. Sooke resident Tanis Nielsen-Rhoads issued the following Food Bank Challenge to all residents of Sooke today. 7,000 cities around the world will be switching off the lights that light up their most iconic buildings. The Houses of Parliament, Sydney Opera House, The Eiffel Tower, The Burg Khalifa, The Taipei Tower will, for an hour, be cast into darkness. Meanwhile millions of people will also turn their power off. It will be quite a sight and will send a clear message: we want action on climate change. As you may guess, I’m no neutral on the subject. I studied the evidence as an undergraduate 15 years ago when there was a growing concern in the scientific community. Their response was to widely advocate a precautionary approach. The evidence and the scale of the problem it points to has only grown since then. It has been part of my motivation for setting up Streetbank. The issue is unsexy, vexed and is generating a crisis that unfolds too slowly for the media to adequately report. But as Barack Obama says “we are the first generation to feel the effects of climate change… and the last generation that can do something about it”. Let’s not turn-off, dial-out and bury our heads but allow #earthhour (if you are on Twitterk) – a simple mass action to make us think. Watch this video and be inspired… There’s fun to be had in – for instance - consuming less, cycling more, living better. Now Accepting Registrations - we do the work - you tell your story! 4th Annual Volunteer/Non-Profit Fair, Sat. April 11th, 2015 12:00 - 3:00 p.m.
VolunteerBC's Annual Photo Contest is here! Local volunteer organizations find they have two big challenges: getting grant funding and promoting their cause or event. “We have a great volunteer base in Sooke yet we hear even the most enthusiastic volunteers could use some help with grant writing and promotion,” said Marlene Barry, Chair of the Sooke Region Volunteer Centre (SRVC). A Grantsmithing Tips Evening will take place on April 23rd, presented in partnership between SRVC and Sooke Region Food CHI. It will be an informative evening for local groups to learn ways to source out successful partnerships and funding grants. Representatives from the Victoria Foundation and Vancity Foundation will be on hand to provide tips on how to get grant funding. Please note that location information is not included in the poster. This is not a public drop-in event so a registration process is required. We connect with individuals one-on-one beforehand. Once they go through the intake process we make them aware of the orientation event details, if they want to take that next step in the Network. Click here for answers to Frequently Asked Questions, and here for the Sooke Poster. Another great opportunity to promote your volunteers and organization during National Volunteer Week. Volunteer BC's Annual Photo Contest is Here! Do you have photos of volunteers that "rock" your community? A volunteer action is like a stone thrown in a lake: its effect has a direct impact and like ripples,volunteer efforts reach out far and wide to improve communities. Like stones - volunteers are unique. 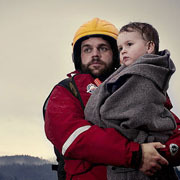 Royal Canadian Marine Search and Rescue, Sooke Division was last year's first place winner! This picture of Paul (RCM-SAR Station 37 Sooke member) was taken by Rob Duffus. Send VolunteerBC photos that reflect the unique qualities of your volunteers and the strong contribution they have in your community. Photos must be taken in the 2014/2015 year. Multiple entries are allowed. Submit photos to: volbcphotos@gmail.com by April 6. The Cycle of Life Tour (COLT) is a group cycling event in support of hospice care on Vancouver Island. Hospice care is an incredible community service that provides end-of-life care focused on palliative treatment. Founded in 2011 as a solo ride, COLT adopted a group ride format in 2013. With 50 cyclists raising pledges for hospice care annually, the event has raised $115,000 to date. A crew of dedicated volunteers and sponsors make COLT possible each year. The 2015 event will be held on July 25-26. Visit www.cycleoflifetour.ca to find out more. If you are an avid cyclist and would like to support Sooke Hospice Society this might just be the event for you! The social enterprise movement is growing and more charities than ever are asking, "is social enterprise for us"? The Enterprise Non-Profits BC's informative "Building your Social Enterprise" workshop provides a unique opportunity to have your questions answered. Register and detailed information here. 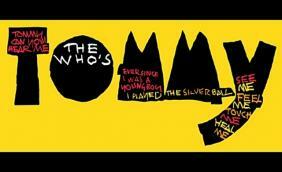 Want to be a part of one of the greatest Rock Operas of all time? Come on out and show your talent! We are looking for vocalists and musicians to re-create this iconic classic. All musicians are requested to email Stephen J. Horak, our Musical Director, for info on ensemble auditions (phantomxiis@gmail.com). [news-Sooke-Etsy] SookeSpace, part of the creative triad in Sooke, has established a presence for Sooke makers and artists in Etsy. This team will benefit from a collaborative effort in marketing and promoting of Sooke-based arts and crafts, and peer-to-peer learning on how to build better and larger businesses on the Etsy platform which already attracts a large international base of buyers. Early team members from Sooke include Catherine Sutherland from SookeSoap; Pat Godbout from patricgoudboutart; Vincent Fay from DirtyDragonStudio; Sarah Howells from PhotosbySarahHowells; and Jenna Lee from Jennaleeart. Team membership is open to all makers, artists, aficionados of Sooke arts and crafts from [news-Sooke-Etsy2] anywhere in the globe. Sellers and buyers both are welcomed to join the group. This is a U.S. based article though much of it applies to our local Coast Capital Credit Union as well. As the U.S. continues to recover from the financial crisis started over seven years ago, the prospect of "too big to fail" banks still lingers because no real reforms have been made in the financial sector. But what if that change started at the grassroots level? What if average citizens took their money out of Bank of America, Wells Fargo, and Citibank and put it in local credit unions? Well, this is already happening. Last year saw the largest increase in credit union membership in 25 years. Why? Because unlike big banks, credit unions are not-for-profit, cooperative, tax exempt organizations that are owned by their depositors. They exist to serve their depositor-owners, not shareholders as in the case of big banks. This enables them to offer lower fees and higher interest rates than big banks all while offering the same services. This makes credit unions the one place where trickle down economics actuallly work. Boys & Girls Club Services of Greater Victoria is seeking a full-time Youth Justice - After Hours Activity Support Worker. The positions is 35 hours/week at $34,035 to $38,220, depending on qualifications and experience. This position closes at 12:00pm on March 23, 2015. Details and information can be found on BGCSGV's website. Boys & Girls Club Services of Greater Victoria is seeking a part-time Development and Communications Officer. The positions is 21 hours/week. This position closes at 12:00pm on March 23, 2015. Details and information can be found on BGCSGV's website. The Burnside Gorge Community Association is seeking a part-time Support Childcare Worker. Position is 18.5 hours/week, $15/hour. Closing date is Monday, March 23rd at noon. Please see their Employment Opportunities page for full job description and application details. Victoria Women In Need is looking for a part time Assistant Mover/Swamper to assist in the pick-up and delivery of stock, furniture and recycling in the community and between stores. Please see the full job posting and how to apply here. Wednesday, March 18th, 2015 - 5:30 - 7:30 at the Sooke Family Centre, 6672 Wadams Way. We will be discussing this year's budget and up-coming training opportunities. Bring food to share if you can. Everyone is welcome. Members are encouraged to bring their challenges and concerns for discussion. If convenient, please bring snacks to share. Marketing, Promotion and Communications begins on Saturday, April 18th and continues on Saturday, April 25th (9:30-noon each day). Effective promotion and communications help local groups build awareness of events, attract new members and raise revenue through donations or grants. We are pleased to be again hosting the 4th Annual Sooke Region Volunteer/Non-Profit Fair on Saturday, April 11th and during National Volunteer Week. A volunteer fair is an opportunity for volunteers, prospective volunteers and volunteer based groups to get to know each other. Whether you are looking for help or looking to give of yourself in some way, this is a great opportunity. Come find out what some of the over 180 non-profit clubs, groups, societies and charities are doing in the area we call the Sooke Region, from East Sooke to Port Renfrew. It is also a great opportunity for the organization representatives to network and brainstorm. There will be refreshments, games and a silent auction. Any group, club, organization, society or charity may participate. 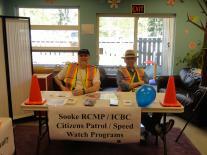 We provide 4' of table space for free to members of the Sooke Region Volunteer Centre ($25/yr). The cost to non-members is $20 for 4' of table space. Additional table space can be rented at ann additional $10 for a whole table. For more information and to register please contact sookeregionvolunteers@gmail.com or leave a message at 250-642-6364 Ext. 235. 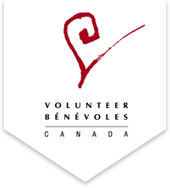 Registration is now open for the upcoming May 28-29 conference from the Administration of Volunteer Resources BC (AVRBC)! This is an opportunity for the best minds in volunteer management to get together to learn, network, and share. This year's conference - "Sowing the Seeds for Innovation" - features a special keynote presentation from nationally recognized volunteer engagement strategist Beth Steinhorn, president of JFFixler Group, a cutting-edge thought leader and developer of volunteer engagement solutions. Coastal Crunch Granola - Owner Sheila Wallace has generously sponsored the Sooke Region Volunteer Centre - $1.00 from every bag of granola sold will go to support our endevours! Thank you, Sheila! The Sooke Region Volunteer Centre (SRVC) is presenting a series of educational opportunities for local non-profit organizations on marketing, promotion and communications at no cost to SRVC members. $10.00 for non-members. Effective promotion and communications help build awareness of your organization or event to attract new members and attendees, it can help you raise revenue through donations or grants. and it can keep you in touch with your members and customers. You are cordially invited to participate in Sooke Rotary's 24th annual Auction & Spring Fair! You’ll find food, fun, and bargains galore. Everyone's invited, from bargain hunters to brazen bidders, young and old. Silent auction, live auction, door prizes, display booths, garden sales, and more! And all in support of a good cause. 10 am to 10 pm at SEAPARC Leisure Complex. For more information check out the Auction webpage here. This new Transition Sooke/Awareness Film Night co-venture met for the first time at the Sooke Region Volunteer Centre on Feb. 25. 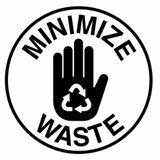 Inishoge Farm's Steve Unger has stepped up to coordinate the citizen's initiative, which will meet again at the SRVC on March 26th at 7 p.m. A public education campaign promoting the 5Rs of the zero waste movement - Refuse, Reduce, Reuse, Recycle and Rot in that order - is a priority. A proper compost facility, yard-waste depot and free store for unwanted items may well be good fits for Sooke. And there's talk that a community open space meeting dedicated exclusively to waste management issues would be timely later this year. If you want to join this inspiring initiative, please contact us! A website is in the works, but for now please visit the organization's Facebook page. My business or career keeps me so busy, I find that I am less able to put aside the time to work on important projects and opportunities. Our business or organization is growing so rapidly, I find it difficult to maintain a close relationship with all of the new staff and departments. We are downsizing. How do I manage change in my organization and keep pace with all of the new developments? As our organization grows, I find it difficult to communicate effectively across the organization to maximize the potential for each project. How can I more effectively get my point across? Morale is down across the organization and I am not sure why, or what to do about it. There is no cost to participate. To comply with the International Coach Federation Confidentiality Code of Ethics, your coaching session will be kept confidential. If you are interested in booking a coaching session please contact Annette Siewertsen to set up a time at 391-2600 Ext 4372 or by email at: annette.siewertsen@royalroads.ca. As of December 31, 2013, there were 86,617 registered charities across Canada, up from 86,159 on December 31, 2012. 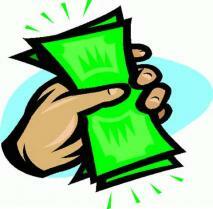 Canada's approximately 86,000 registered charities issued receipts worth more than $14 billion in 2012. In the 2013-14 fiscal year (April 1 to March 31), the CRA's Charities Directorate completed 845 audits of registered charities chosen using a variety of methods, including random selection, follow-up on possible non-compliance or complaints, and based on a review of annual information returns; during that same period, 23 charities had their registered status revoked by the CRA as a result of an audit. As of March 31st, 2014, the CRA had reassessed more than 190,000 taxpayer returns, denying in excess of $6.3 billion in donation claims. The CRA has also assessed more than $162 million in third-party penalties against promoters and tax preparers. The Victoria Sexual Assault Centre is looking for a Victim Service Worker Assistant. Deadline to apply is Monday, March 16th, 2015, 4:30pm Please see detailed information on their website. HeroWork is looking for New Projects! Part-time Office space for rent. Wednesday, February 18th, 2015 5:30 - 7:30 at the Sooke Family Centre, 6672 Wadams Way. We will be discussing this year's budget and up-coming training opportunities. Bring food to share if you can. Everyone is welcome. 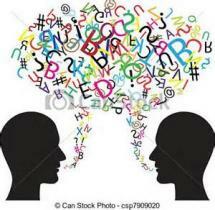 Members are encouraged to bring their challenges and concerns for discussion. Something special for Sooke's non-profits! Sooke Region FoodCHI and Sooke Region Volunteer Centre invite you to an informative evening learning approaches and tips to how to source out successful partnerships funding grants. The money is out there, how can we all bring more of it to our communities? Rrepresentatives from the Victoria Foundation and VanCity Foundation will join us for the evening. We need your help - tell us what topics or questions you would find helpful. For more information and to participate please complete the on-line survey here or contact us at sookeregionvolunteers@gmail.com for a Word document version. Please complete this survey by February 28. April 15th, 2015 - Individual meetings to follow-up on topics covered and to provide custom feedback. If you haven't heard of this group you need to!! The HeroWork Program Society organizes modern-day versions of old-fashioned barn raisings for worthy charities who own their building or land. Called Radical Community Renovations, these renovation events are fast-paced, leadership-driven events that bring people, communities, and companies together. paul@herowork.com or call (250) 590-4221. The Sooke Region Volunteer Centre rents space in the Sooke Child, Youth & Family Centre 2 half days per week. The space has additional availability and includes many services. If you are a non-profit organization, especially one with a youth/child focus, and are looking for part-time space, please contact us at sookeregionvolunteers@gmail.com for further details. Listing promising initiatives underway throughout the province, such as the activities by their PlanH Healthy Communities Capacity Building (HCCB) Grant Recipients. Also information for Health Community Municipalities. Canadian Blood Services is seeking a part-time Volunteer Coordinator. Position is a .80 FTE, $22.95 per hour. This posting will remain open until the position is filled. Please visit www.blood.ca/en/job-seekers for more details. Pacifica Housing is seeking a part-time Director of Human Resources and Administration. This position is primarily accountable for human resource management, fund development and corporate development. As a member of the organization's Leadership Team the Director is accountable for participating in strategic and operational planning decisions as well as expanding and enhancing the public profile of the organization. For full posting details and application instructions please visit our website.